One might think “these are only a couple of structures, there is much more!” That’s true, but I think most of us will encounter one or more of these structures in ‘real life’ from time to time. The Isolated and hanging pawns belong to each other like a Siamese twin. The same is valid for the Maroczy structure and the Hedgehog. The usefullness of this selection depends on one’s opening repertoire. For me it’s fine. But maybe not for everybody. The material is of high quality. The viewer gets great insights in the plans and the way to deal with these structures. The examples range from the classics to the modern players. In the end of the DVD there are 8 tests. So one can see if everything is well understood. Most of the videos are rather short (generally not more than 10 minutes). But that’s not a problem. What is a problem however is the speed with which Adrian presents his material. He moves the pieces with the speed of light. More often than not it is impossible to follow the moves. It happened several times that he goes over the moves in a fast pace, then stops and says white or black is winning. I thought “Huh’? Winning, why?” And then I suddenly realized that a piece was missing. At some moment it starts to irritate. I hear also quite often “The rest is easy!” I doubt if everybody feels the same way. It has to be said: one can replay all the moves at one’s own desired speed through the files of all the games. But from the viewpoint of presentation this is not good. This raises an intriguing question: isn’t there anybody at the Chessbase office who directs these trainers? My judgement: great material, well structured, good explanation until Adrian goes beserk. Presentation: because of the speed, not good. 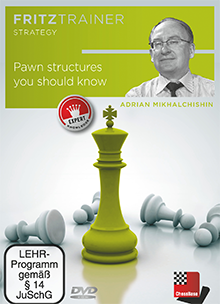 You can order this DVD from the Chessbase shop (as download or DVD). There you will find also an example video.